View from the top of the driveway. It was a warm mid-day and I was getting bored waiting for the varnish to dry on the rune circles I was creating to hang on the outbuildings here at PsiKeep. I was casually browsing Facebook when the first posting of a 20 acre fire off of Bottle Rock Road on came up on the screen. I did not think too much about it. It was a small fire and at that time another small fire closer to Kelseyville was also reported. But when I checked back a few minutes later the first fire was at 400 acres. I called several people up on Cobb Mountain. Neither party answered so I left messages about the fire and went to take a nap. When I woke a couple of hours later the sky in the west was a wall of black and a blood-red sun was throwing a deep orange light across the land. The Valley Fire from Spruce Grove Road. What I saw was horrifying. 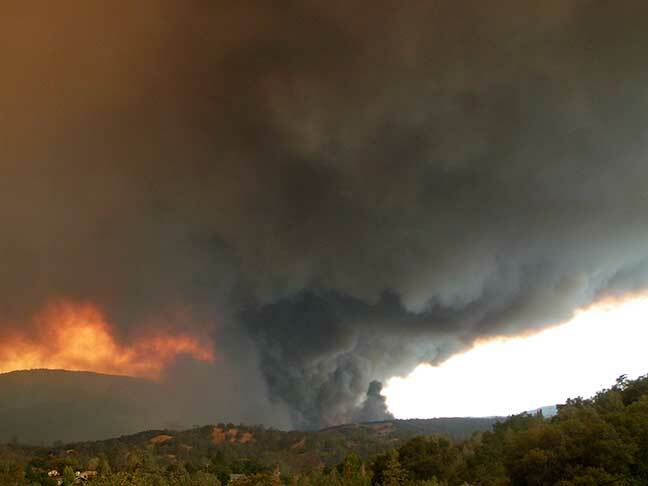 The sky was filled with towering clouds of black smoke blistering and buckling against the sky and that monster of a fire was racing down the mountain like a juggernaut. Nothing man-made would stop this thing. 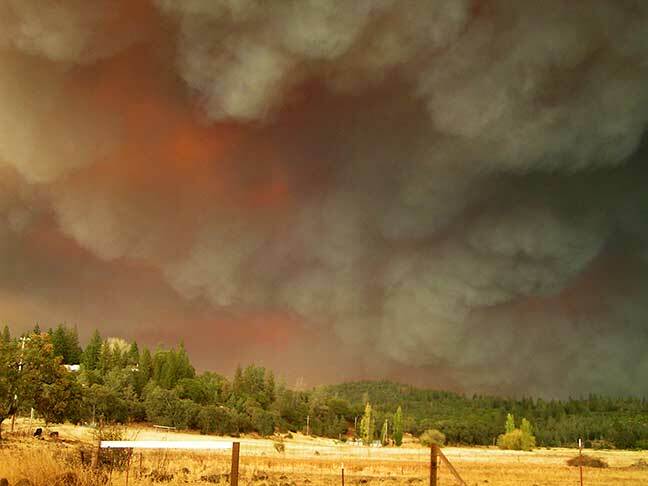 It leaped from ridge to ridge belching fire storm after fire storm as houses, out buildings, Ponderosa pines and dry chaparral exploded in the heat of its breath. The Valley Fire from the lookout point on Spruce Grove Road. 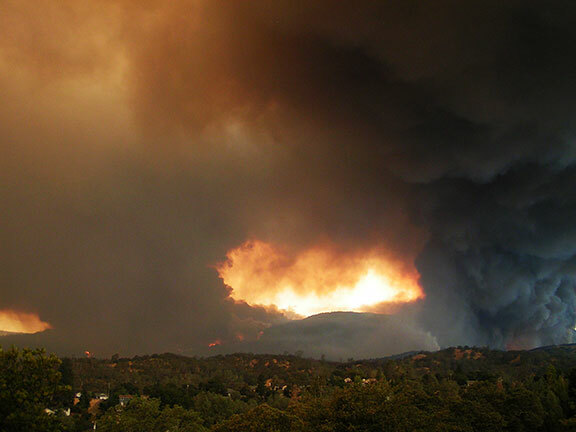 The fire was running to the south-east and my greatest worry was the edge of the fire in the north-west. With the wind up it was aimed right toward Jerusalem Grade. I jumped in my car and drove down to 29 and headed north hoping to find out more information as to where that wing of the fire was headed. I made with run up 29 to Spruce Grove Road north without being able to determine anything. The fire was just too big. The Valley Fire seen from a meadow on Spruce Grove road between the north and south entrance. So I headed back home and began packing to evacuate. Once again you grab the things that mean the most, the dog, the one cat I could catch, the remaining chickens, (Another story to be told later.) hard drives, book projects, the icons from the shrine, computers, my Red Cross bag of toiletries from the Jerusalem Fire evacuation and a few clothes. And then it is that heart wrenching finality of walking out the door knowing you have given up everything behind you. You’ve let it go hoping for the best and knowing that there was a high certainty that all could be lost. It was dark by the time I had finished packing the car. The sky to the south was on fire. I set the goats free hoping they would make it as best they could since I had no way of getting them out. I caught the old buck, Jonas, he was still under medication, and tied him to the side mirror of the car. Once again I turned my back on my home and everything I had built and started up the drive leading the goat behind. At the top of the drive I expected to see fire engines and emergency personnel. The gate at the cinder-block towers was also a fire road leading directly into the ridge behind Hidden Valley Lake but there was no one around. The road was deserted. I parked the car, deciding what to do next when a vehicle came down the road. I flagged it down. Inside the vehicle were a couple of growers and they said that there were no mandatory evacuations for Jerusalem Grade. So I dragged that poor goat back down the drive. I caught the rest of the goats and put them back into the pens. I sat in the car for a long while watching the orange glowing sky in the south while ash and cinders falling thick as silver snow rained down around me. 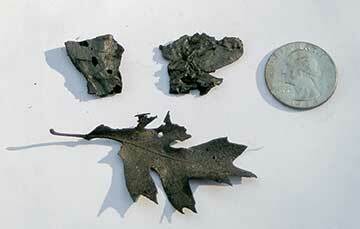 Samples of two cinders and a charred leaf found in the driveway after the fire had passed. After a long while I decided to go back into the house and watch the glowing sky from there. Inside I felt like I was living that scene in “War of the Worlds” where the main character is trapped and hiding in the cellar of a house where one of the invading Martian space ships has crashed into structure. The power was gone. I was able to drain some water from the pipes. I wandered around my house with a head lamp while outside danger trampled the land. 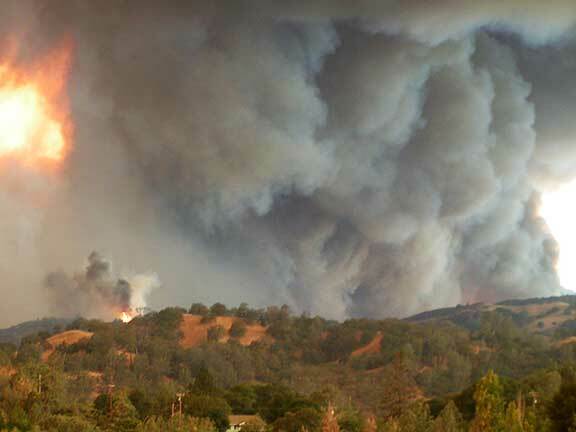 The next morning I was still able to use the phone and I called Corky and Sharon Schmitz, where I had stayed during the Jerusalem Grade Fire evacuation. I asked him if I could bring over some chickens. He told me to bring everything over and he would help me transport the goats to his farm. The intersection at 29 and 53 was closed by the time we had the trailer hitched to Corky’s truck and were ready to rescue the animals. I was able to talk our way back in by saying we were going in to rescue our livestock and they let us pass. Once inside the fire area it was like driving into the heart of darkness. We drove down the road as the smoke thick as fog enveloped us only it fog was hot and choking. We past no one coming either way. The land was empty. Everything was still as death while ahead the horrors burned.